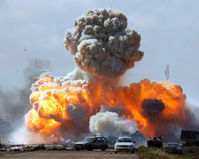 [I]n the case of Libya, the word “war” has been dropped altogether from all discourse about Western intervention. It’s called a “responsibility to protect civilian lives”. This disarticulated language and meaning is repeated even though the factual truth of what is happening is an exact conformation to the word “war”. And not only “war” but “criminal war”. The murder of civilians by NATO warplanes is a war crime in the normal framework of fact, truth, reality, law and morality. But in the abnormal, hideous framework of Western imperialist propaganda it is called “protecting civilians” and “supporting democracy”. In times like these, independent reporting is crucial. Our correspondent in Tripoli, Mahdi Nazemroaya, is providing our readers with honest reporting by denouncing NATO war crimes in Libya. On the contrary, the mainstream media (MSM) has links to NATO and the armed rebels. Their actions are rarely, if ever, questioned. The mainstream reports clearly serve NATO’s agenda. Its claims remain unchallenged. Nothing is said about its war crimes. Official statements from NATO countries are transmitted to the public without any substantial analysis of the reality on the ground. One way to lie is to accept at face value what are known to be official lies, uncritically passing them on to the public without adequate confirmation. People’s minds are battlefields in which the MSM bomb biased reports, propaganda and disinformation on a daily basis. One way to fight back is to support independent reporting at Global Research. Make a donation. Become a member. Join the battle. Don’t let the lie become the truth.